“A dog, a gun and time enough." These were among the things that George Bird Evans treasured most. One of the world's foremost authorities on upland bird shooting and fine bird dogs, Evans had the good fortune of enjoying an abundance of all three during his ninety-one years. In addition to experiencing and meticulously recording the results of more than sixty-five hunting seasons, spent primarily in West Virginia's Allegheny Mountains, Evans found time to author more than two dozen books and countless magazine articles about the sport that was both his vocation and avocation. He also bred a line of English setters whose descendants are treasured today by bird dog enthusiasts throughout America. Evans's life was in many ways a charmed one. Born in Uniontown, Pennsylvania in 1906, he was raised by parents who were cultivated, loving and highly supportive of their precocious and multi­ talented son. His father, a tailor by trade, preceded him in his love for dogs and fine guns both of which figured prominently in many of Evans's earliest memories. 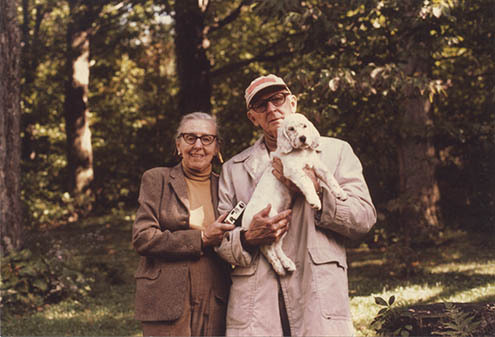 George and Kay Evans with dog, Holly, in 1980. Bright and inquisitive, Evans also shared a love of learning, literature and the arts with his father. An excellent student, he skipped a grade in elementary school and was, thus, only seventeen when he left home to attend Carnegie Institute in Pittsburgh in 1924. Intent on pursuing a career in art he earned his keep while at college playing saxophone in a dance band. It was at Carnegie that Evans met his future wife, Kay Harris of Wheeling. After George transferred to the Art Institute of Chicago in 1925, the two kept up correspondence and a courtship that ultimately led to marriage several years later. George decided that he was ready to break into the field of illustration in 1927. Moving to the nation's publishing capitol, New York City, he found work with a variety of publications including McCall’s Magazine. He spent the next eleven years working on a freelance basis for these and other clients before landing an exclusive contract to illustrate mystery and detective stories for Cosmopolitan in 1938. The job paid well, well enough, in fact, for George to begin contemplating a very early retirement while still in his mid-thirties. To prepare for that eventuality, the Evanses bought a Revolutionary War era hewn-log farmhouse in Preston County, West Virginia in 1939. Though it lacked utilities and was primitive by all other means as well, the couple quickly decided that they could not wait to until retirement to move in. Convincing his editors that the mountain air would stimulate his creativity, George and Kay left New York for good in June 1939 and moved into the home they named “Old Hemlock.” For the next three years, George's work commuted back and forth to Cosmopolitan headquarters via the U.S. Mail. Throughout his sojourns to Pittsburgh, Chicago and New York, he had returned to Uniontown regularly to hunt, often with his father's bird dogs by his side. George began documenting his forays into the woods in a "shooting journal" begun in 1932. He would continue this journal for the next six and one half decades. George served as an illustrator for the U.S. Navy during World War II. At the war's end, he returned to Old Hemlock and resumed his illustration work but soon found that the industry was rapidly changing. People were turning increasingly to television for dramatic entertainment and magazines were responding by gravitating away from fiction and original artwork towards nonfiction and photography. Having grown tired of deadlines, and on relatively firm financial footing, George decided that it was time for a personal change in direction as well. Rather than working on assignments and timetables imposed by others, he would henceforth work for himself at his own pace, not as an artist but as an author. George Bird Evans poses with Blue and Dawn, ca. 1940. George and Kay were voracious readers. The two had often speculated that they could write as well as many of the popular authors whose works George had illustrated through the years. Thus, it came as no surprise to Kay when her husband announced one day that they would collaborate in writing mysteries. Published between 1950 and 1961 under the pseudonyms Brandon Bird (novels 1-4) and Harris Evans (novel 5), the "Old Hemlock Mysteries" as they later became known won George and Kay a modest fame and fortune. More importantly, they honed the pair's writing and editorial skills for the more significant literary ventures that lay ahead, ventures focusing on George's life-long passion for dogs, guns and game birds. Considering his upbringing, it is not surprising that in George's opinion, a house was not a home without a dog, not just any dog but an English setter. George and Kay trained a “blue belton” setter (white coat with blue/black flecks and patches) that they named Blue. After some searching, they found a mate for Blue, an “orange belton” setter (white coat with orange flecks and patches) they called Dawn. Blue and Dawn were successfully mated at Old Hemlock after George's return from military duty. Their brood of nine became the foundation of the Old Hemlock line of setters and set its dissemination in motion. The descendants of the offspring of this legendary couple are treasured by bird dog lovers to this day. 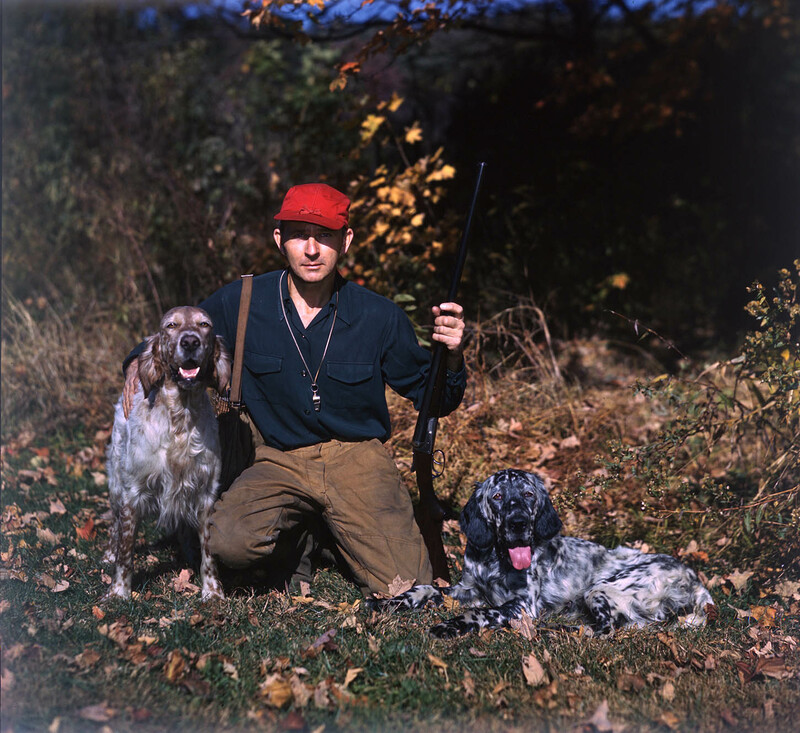 As the hunting seasons passed, George continued to plan his life around his forays into the woods with dog and gun, and usually with Kay at his side. As he had done since 1932, he continued to document his outings in a journal that traced his steps, described his experiences, and documented his observations right down to the precise number of birds flushed and shots fired. It was not long after the couple had begun their literary career that George realized that his shooting journal notes "cried out to be magazine articles." When George's article "Design for Setters" appeared in Field & Stream's December 1956 issue, no one could have realized its significance as the debut of the preeminent voice in upland game bird shooting of the second half of the 20th century. Focusing on his experiences and philosophy regarding the breeding and training of English setters, it was evident, however, that this voice spoke with an eloquence, a breadth of knowledge and a sensitivity that was all too rare in this genre. George Bird Evans and dogs in the forest, date unknown. Over the next decade and a half, Evans published an average of three articles per year. Most appeared in either Field & Stream or Pennsylvania Game News. In addition to more essays on breeding, training and simply admiring fine bird dogs, he wrote about firearms, birds, habitats and especially on the joy of experiencing and appreciating the glorious interaction of all of the above. Evans published his first monograph about his sport and the utopian existence he had forged at Old Hemlock, in 1971. Titled The Upland Shooting Life, the book is a manifesto, an autobiography, a manual, and a wildlife romance all rolled into one. An instant classic in the literature of this field, The Upland Shooting Life gained George Bird Evans a loyal following that would last for the rest of his life and far beyond. Many more books were to follow including Troubles with Bird Dogs (1975), The Upland Gunners Book (1979), Grouse Along the Tramroad (1986), to name but three. Altogether, these books would solidify his position as one of the foremost writers of all time in his genre. By the time of his death in 1998, the bibliography of books by George Bird Evans had grown to some twenty-seven monographs (including re-issues) and well over 100 articles. 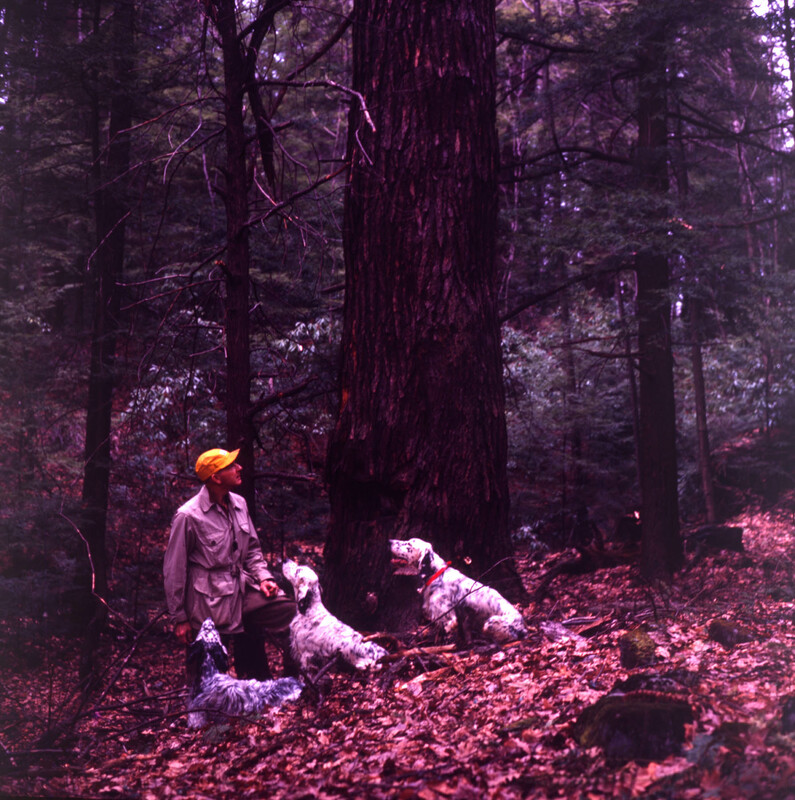 Adding to his legacy is his enduring contribution as the breeder of the Old Hemlock line of English setters whose descendants are still treasured by bird dog enthusiasts everywhere. In his own eyes, however, it is quite possible that Evans would consider his greatest accomplishment to be his very existence and the manner in which he lived it. Still hunting at age ninety-one, just a few weeks before his passing, his life was, after all, the epitome of everything he desired -a life well spent, in the company of his beloved wife Kay, with "a dog, a gun and time enough."